Hanoi’s leading bus operator Transerco has commenced with the trial of sightseeing bus tour services using double-decker buses, offering tourists a new choice to explore the capital city. Known as City Tour, the service follows a loop route that starts at the Hanoi Opera House and takes tourists to the city’s famous destinations such as the Temple of Literature, Thang Long Citadel, Tran Quoc Temple and the Old Quarter. For easy recognition, the bus has red as its primary colour, supplemented by blue, green and yellow stripes and a stylised picture of the Temple of Literature’s Khue Van Cac Pavilion, a symbol of Hanoi. In Ho Chi Minh City, the entire fleet of buses servicing route 32 between Mien Tay Bus Terminal and Nga Tu Ga Intersection will be replaced with 26 new buses powered by clean natural gas as of July 1. The new buses will be added to the existing 170 environmentally-friendly vehicles servicing 5 routes. 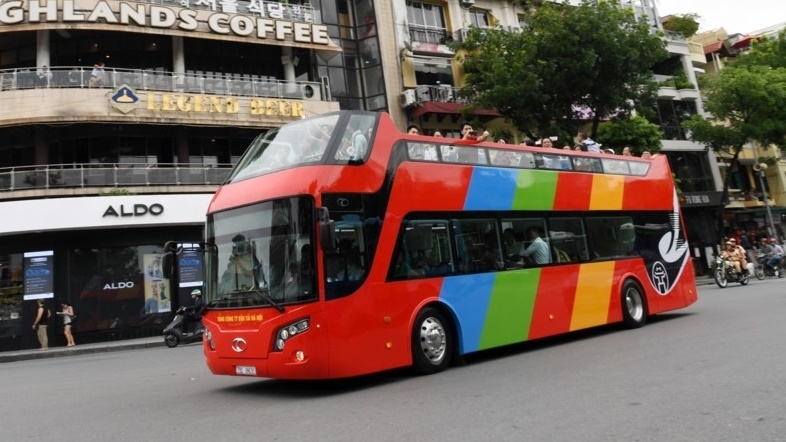 In its plan to replace 1,680 old and outdated buses, Ho Chi Minh City will focus on increasing the number of vehicles using clean natural gas and phase out diesel-powered vehicles. Meanwhile in the central city of Da Nang, a new bus service supported by the Toyota Mobility Foundation has been launched as part of the project to improve the city’s urban transport. The service will be free for a year, including free parking at a nearby parking lot, to encourage local residents to use public transport. The service is offered from 5h45 to 20h45 with a frequency of one bus every 10 minutes during peak hours and 15 minutes throughout the rest of the day.